Lotusroots from lotus flowers (a.k.a. water lily) grow underwater in the mud. They have sausage-like sections in tuber form that have air canals through them. Lotusroots are consumed by many cultures throughout the Asian region, as medicine, tea, salad, soup, stir fried, deep-fried and even juicing! The root is crunchy and crisp with a mildly sweet flavor very much like the water chestnut texture. Most parts of this plant have healing virtues and can be eaten: the root, young flower stalk and seeds. Lotusroot is rich with vitamin C and traces of the B vitamins. It also has the important minerals like iron, phosphorus, copper, manganese, calcium, sodium, and high amount of protein. The lotus plant is unique as it is the only plant that can live in water, earth and air all at the same time. It has great health benefits and the Asian cultures have realized these facts from ancient days. 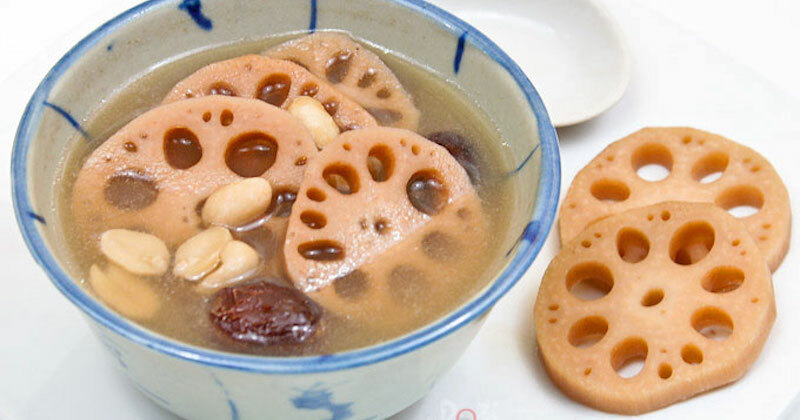 Anemia due to heavy menstruation: Lotusroot juice or soup is useful for blood building in women who are losing blood due to heavy menstruation. Drink of the juice or soup three days continuously after menstruation. Bleeding, stop: Traditional Chinese Medicine uses lotusroots juice to stop bleeding in the esophagus, intestines, stomach, colon and even nose bleeding. Here’s how to make a lotusroot juice to stop nosebleeds. Constipation or diarrhea: The juice is very mild and calming to the stomach, and helpful for relieving constipation or to stop a diarrhea. Energy booster: The rhizomes are adapted tubers, which grow in mud under the water and store energy in the form of carbohydrate/starch.The Eastern Oriental medicine believes that eating lotusroots and the seeds can help enhance the energy level and vigor of the body. Heart protection: Lotusroot contains the B-complex vitamins such as vitamin B-6, niacin, pantothenic acid, folate, riboflavin, and thiamin. It guards against the risk of heart attack by controlling damaging homocysteine intensity in the blood. Intestinal complaints: Consuming lotusroot helps prevent intestinal and colon diseases; treating swelling of the enteritis or intestine. Drink a combination of the lotusroot juice with ginger root juice. Mucus Elimination: The high vitamin C content in lotusroot juice helps to break up mucus accumulation in the respiratory system and eliminates it from your body. It releases the mucus or phlegm accumulation in the lungs and dissolve them, thus is helpful as remedy for asthma, bronchitis, cold, cough and tuberculosis. For better effects, juice lotusroot with equal amount of carrots. It makes a highly nutritious drink and is delicious too! Nervous control: The root contains Pyridoxine (vitamin B6), which operates as coenzyme in the neuro-chemical synthesis in brain that persuades the mood. Sufficient pyridoxine intensity helps in controlling the nervous petulance, tension and headache. Sinusitis: Due to its ability to melt or dissolve mucus accumulation, regularly drinking lotusroot juice also helps to alleviate sinusitis. Temperature control: Drink lotusroot and orange juice to bring down fever, or a hot lotusroot soup as remedy for a cold. Make a soup of lotusroot and carrot, add chicken if you like. 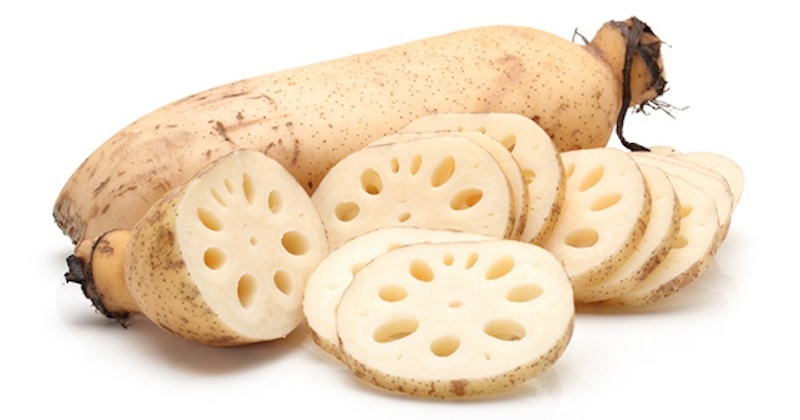 Choose lotusroots that look crunchy and juicy and have no soft spots or blemishes on the exterior. Store lotusroots wrapped in plastic bag and store in fridge. Consume within five days for its best taste and nutrients. To prepare lotusroot, cut off the joints of each section, then scrape off the thin layer of its skin with a spoon. For cooking or making soup, slice the lotusroot across at about ¼-inch thickness. For juicing, cut up the root length-wise, juice it uncooked (raw). As lotusroots grow in the mud, their air canals could possibly harbor mud. Wash them clean and cook thoroughly to prevent poisoning. For making juice, choose the variety that has no mud inside the air canals. How would you know when you buy them? You probably won’t know when you first buy them, but by experience you will soon know which ones to get.